If you have ever visited an offshore Internet gambling website, chances are you visited Antigua and Barbuda, a small island nation in the Caribbean that has become a popular host for online gambling sites. While this has led to some tensions between the U.S. and Antiguan governments, relations are generally friendly, and this English-speaking democracy is a popular destination for American travelers. Lay of the Land: The country of Antigua and Barbuda comprises two main islands that give the nation its name. Antigua, which is nearly twice the size of Barbuda, is a small, hilly island in the eastern Caribbean, with rocky coasts, few springs, and a tendency to drought. During 350 years of colonial rule, British plantation owners replaced Antigua’s native forests with fields of sugarcane and cotton. Antigua is the main population center and the focus for government, business and tourism. Barbuda, which lies about 25 miles north of Antigua, is home to one town, about 1500 people and a sanctuary for frigate birds. The islands constitute an area of 171 square miles, roughly 2½ times the size of Washington, D.C. The capital is St. John’s, a city of about 31,000 people. Part of the Lesser Antilles archipelago about 500 miles north of Venezuela, where the Caribbean ends and the Atlantic begins, Antigua and Barbuda enjoy a maritime tropical climate. To the south lie the islands of Guadeloupe, Dominica, Martinique, Saint Lucia, Saint Vincent and the Grenadines, Barbados, Grenada and Trinidad and Tobago. Montserrat is to the southwest; Saint Kitts and Nevis and Saint Eustatius are to the west, and Saint Barthélemy, Saint Martin and Anguilla are to the northwest. San Juan, Puerto Rico is only 300 miles to the west. Ethnic Groups: African 91%, mixed African-European 4.4%, other 2.9%, European 1.7%. Languages: Antigua and Barbuda Creole English 98.0%, English (official); Literacy is above 85%. Pre-ceramic Amerindians were the first to inhabit the islands of Antigua and Barbuda around 2400 BC. Later, Arawak and Carib Amerindian tribes populated the islands. Christopher Columbus landed on Antigua during his second trip in 1493 and named the main island Santa Maria de la Antigua. The British began to colonize in 1632, beginning 350 years of rule, interrupted only by a very brief French interlude in 1666. The British replaced the subsistence agriculture of the Amerindians with a plantation economy based on sugarcane production for export. They imported thousands of Africans to work as slaves on their sugar plantations under brutal conditions that led to high death rates. Slavery was abolished throughout the British Empire in 1834, but the slaves of Antigua and Barbuda found their condition little changed because they had no access to arable land or credit. Beginning in the 1940s, a labor movement among the sugarcane workers became the basis for an increasingly vocal independence movement, which was led by Vere C. Bird, who became the country’s first prime minister in 1981. At that time, Antigua and Barbuda became an independent parliamentary democracy within the British Commonwealth of Nations, with the British monarch serving as the new nation’s Queen as well. Relations between the U.S. and Antigua and Barbuda have been generally peaceful and focused on trade and tourism. During the late 1990s, allegations of corruption, money laundering, drug smuggling and gun running surfaced against the family of aging Prime Minister Vere C. Bird. These issues strained relations between the U.S. and Antigua and Barbuda. In 1990, Bird’s son was directly implicated in illegally shipping assault weapons to a Colombian drug cartel. In 1995, the Prime Minister’s brother, Ivor, was convicted of cocaine smuggling and fined. The following year, American officials expressed concern that Russian organized crime was infiltrating the country. Throughout this period, alleged money laundering (PDF) by Antiguan banks generated a great deal of negative publicity and international concern. In 1999, the U.K. issued an advisory to British financial institutions that Antigua and Barbuda’s anti-money laundering laws were insufficient. Under pressure from both the U.K. and the U.S., in 2000 Antigua and Barbuda strengthened its financial laws and regulations, and the issue is considered to have been largely resolved. By far the main point of contact between Americans and Antiguans lies in tourism. 66,644 Americans visited Antigua and Barbuda in 2005. Since 2002, the number of visitors has fluctuated between a low of 60,680 in 2002 and a high of 70,531 in 2004. Meanwhile, 20,949 Antiguans visited the U.S. in 2006, 4.9% more than the 19,966 that visited in 2005. The number of visitors has gradually increased every year since 2002, when 16,317 islanders came to the mainland. Both countries host expatriate communities of the other’s citizens. About 4,500 Americans live in Antigua and Barbuda, mainly in the capital of St. John’s, which boasts one of the finest medical schools in the Caribbean, the American University of Antigua College of Medicine, where nearly 500 American students study medicine. All told, 84,343 British West Indians (a category including Antiguans and Barbudans) live in the U.S., many of them students. Antigua and Barbuda’s most important industry is tourism, which contributes 60% of GDP and most of the jobs, with most visitors coming from the U.S. and U.K. In 2007, the U.S. imported $8.7 million of goods from Antigua, including goods being returned to the U.S. after processing, bauxite and aluminum. The U.S. exported more than $240 million of goods to Antigua and Barbuda, mainly petroleum products (20% of the total), machinery and equipment (18%), and food products (9%). In 2006 the U.S. gave $2 million in aid to Eastern Caribbean countries (i.e., Antigua and Barbuda, Barbados, Dominica, Grenada, St. Kitts and Nevis, St. Lucia, St. Vincent and the Grenadines). All of the funding was dedicated to Peace and Security, divided between Foreign Military Financing ($905,000), International Military Education and Training ($695,000), and Nonproliferation, Antiterrorism, and Demining ($404,000). In the 2008 budget, aid decreased to $1.6 million, and was divided between International Military Education and Training ($630,000), International Narcotics Control and Law Enforcement ($500,000), and Nonproliferation, Antiterrorism and Demining ($500,000). Are U.S. and U.K. Deportations Creating a Crime Explosion in Antigua and Barbuda? A recent increase in violent crime, highlighted by the July 2008 slaying of a British newlywed couple, has Antiguan Prime Minister Baldwin Spencer laying part of the blame on the U.K. and U.S., for deporting convicted criminals to the island country. In 2003, Antigua and Barbuda filed a complaint against the U.S. with the World Trade Organization (WTO), alleging that the United States’ refusal to allow Internet gambling websites based in Antigua to offer services to American consumers violated free trade agreements signed by both countries. Antigua won its case in 2005, and the countries are still negotiating a final settlement. Antigua and Barbuda is a multiparty parliamentary democracy within the British Commonwealth. The last national elections in 2004 were deemed by observers to be free and fair. While the government generally respects the human rights of its citizens, there are a few problem areas, including excessive use of force by police, poor prison conditions, violation of press freedoms, societal discrimination and violence against women, and sexual abuse of children. In general, while the government tolerates criticism in the press and other media, it occasionally harasses its critics, using both legal and extralegal means. The United States does not maintain an Embassy in Antigua and Barbuda. The U.S. embassy in Bridgetown, Barbados, represents U.S. interests throughout the Eastern Caribbean (i.e., Antigua and Barbuda, Barbados, Dominica, Grenada, St. Kitts and Nevis, St. Lucia, St. Vincent and the Grenadines). Name: Thomas H. Anderson, Jr. Note: Commissioned during a recess of the Senate; a second nomination of Sep 28, 2000, was not acted upon by the Senate. Antigua and Barbuda's Ambassador to the U.S.
Deborah-Mae Lovell, a career Antiguan and Barbudan diplomat, presented her credentials as ambassador to the United States on March 8, 2005. Lovell has twenty-five years of experience in the Antigua and Barbuda Foreign Service. She entered the Foreign Service in 1983 as a Third Secretary in the High Commission for Eastern Caribbean States in London. She worked her way through the ranks, holding several positions including Acting High Commissioner in the Antigua and Barbuda office in Ottawa, Canada, where she headed the Mission for three years. 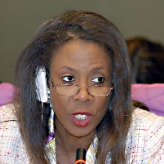 She also held the post of Minister Counselor in the Embassy of Antigua and Barbuda in Washington, D.C., as well as in the Permanent Mission of Antigua and Barbuda to the United Nations in New York. 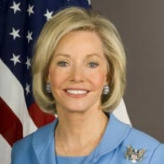 Lovell is dually accredited as Ambassador to the United States and as Permanent Representative to the Organization of American States (OAS). Antigua and Barbuda's Embassy Web Site in the U.S.
Mary Martin Ourisman served as U.S. ambassador to Barbados and the Eastern Caribbean (Antigua and Barbuda, Dominica, Grenada, St. Kitts and Nevis, St. Lucia, and St. Vincent and the Grenadines) from October 31, 2006, until the end of George W. Bush's term as president. She was born February 1, 1946, in Mexia, Texas. She received a B.S. Degree at the University of Texas at Austin in 1970, and further education in the arts and interior design at the Academy of Arts College in San Francisco and the New York School of Interior Design. President George W. Bush appointed her to the Board of Trustees of the Kennedy Center, where she was a founding member of the Center’s International Committee. She has also served on the Board of Trustees of the Washington National Opera. Ourisman has been a member of the Board of Directors of the Blair House, the President’s guest house for foreign Heads of State and is Emeritus Trustee of the Smithsonian Institution in Washington, DC. Extremely active in Republican politics, Ourisman and her husband, car tycoon Mandy Ourisman, donated $443,620 to Republican candidates and committees between 1999 and 2006 alone.